A stunning white flowered low growing plant, originally from the Mediterranean and grown in English gardens for centuries. This Snowflake variety has been bred for a profusion of flowers and a good uniform habit. It has thin evergreen leaves with flowers appearing in spring to midsummer, showing as a carpet of white. It grows to a height of 20 – 30cm. 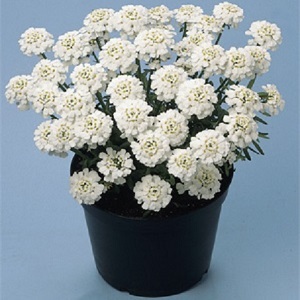 Iberis likes a sunny position in well drained poor soil. It looks good in edging, in rockeries and in neglected spots where it forms high-impact ground cover, with the leaves looking good all winter. It can tolerate dry conditions and light salt spray. Pack of 50 seeds. Sow summer to autumn for next year flower. Easy to grow. Sowing instructions and a colour photo are printed on the packet. Sow spring to autumn in moist seed compost with a light covering of compost or vermiculite. Germination takes 3 – 4 weeks at 15-21°C. Transplant seedlings into pots when they are large enough to handle and plant out into the garden when frost free. Keep summer/autumn sowings in a cold frame or greenhouse over winter, and plant out in the spring. Protect young plants from slugs, snails and caterpillars. Grow Plants need very little care once established. These are evergreen plants and only need a light trim after flowering to maintain their shape. They will spread, but not too vigorously. Semi-ripe cuttings can be taken in summer to grow on more plants.